Onkyo has introduced two new home theater system packages, each combining a sophisticated network receiver with lots of 3D-Ready HDMI inputs, high definition audio and video, and a set of five or seven surround-sound loudspeakers with a powerful subwoofer. These are Onkyo's first packaged home theater systems to include InstaPrevue, a new source selection technology that provides a picture-in-picture display of programs available on connected HDMI devices. • Explore reviews in our AV Receiver Review section. 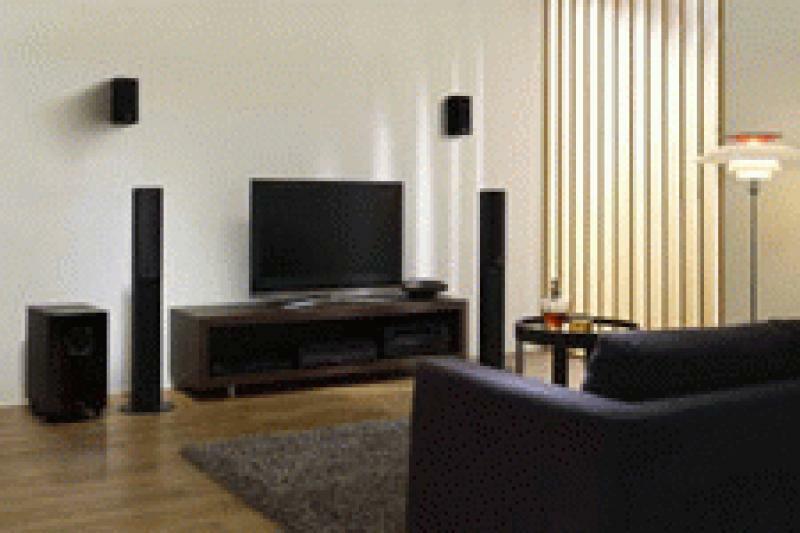 • See reviews of Floorstanding Speakers and Bookshelf Speakers. • Learn more in our Subwoofer Review section. The Onkyo HT-S6500 and HT-S7500 are designed to deliver high definition video with a Marvel Qdeo video processor that can upscale low-resolution video to 1080p for conventional high-definition displays, and to 4K for the new higher resolution displays. For HDMI sources, there is automatic decoding of Dolby TrueHD and DTS-HD Master Audio high-resolution audio sound tracks. Both systems have built-in networking and USB digital access to an array of on-line and digital media resources. The Onkyo HT-S7500 is 7.1-channel system with two floor-standing front speakers, a dedicated center channel, four compact surround speakers, and a 120-watt powered subwoofer. It also includes Dolby ProLogic IIz for the option of a front-height channel. The HT-S6500 is a 5.1-channel system with more compact speakers and the same subwoofer. Both systems are powered by an 80-watts -per-channel receiver with WRAT (Wide Range Amplifier Technology), an amplification concept that reportedly reduces noise and provides large amounts of controlled power instantaneously. TI Burr-Brown 192 kHz/24-bit DACs on all channels, a powerful 32-bit DSP processing chip and discrete amplifier design all contribute to the audio performance. The HT-S7500 and HT-S6500 receivers both have HDMI inputs for seven and six source components, respectively, plus ARC (audio return channel). They also have a direct digital connection for an iPod/iPhone via a front-panel USB Port. This port can also be used with Onkyo's optional UWF-1 Wireless LAN Adapter as well as the forthcoming UBT-1 USB Bluetooth adapter. Both receivers have connections for analog audio, optical/coaxial digital audio, and component and composite video for legacy source devices. These receivers offer Internet Radio connectivity with built-in modules for Pandora, Rhapsody, Slacker, SIRIUS XM Internet Radio, Last fm, vTuner, Spotify, and AUPEO!. They are DLNA certified, Windows 7 compatible, and support playback of MP3, WMA, WMA Lossless, FLAC, WAV, Ogg Vorbis, AAC, and LPCM audio files through a local network. Both receivers support Onkyo's remote control Apps for most iPod touch/iPhone, Android phones and Kindle Fire. Audyssey 2EQ is included to correct room acoustics, Audyssey Dynamic EQ provides for loudness correction, and Audyssey Dynamic Volume to maintain optimal listening levels and dynamic range. Audyssey configuration is incorporated in the new Initial Set-up program. This program employs a graphical user interface that helps the user to set up the system. The Onkyo HT-S7500 has powered Zone 2 and the HT-S6500 has Zone 2 pre-outs. Both receivers have 4 DSP Modes for gaming: rock, sports, action, and RPG. Onkyo's Advanced Music Optimizer expands the dynamic range of compressed digital music files. The Onkyo HT-S7500 and HT-S6500 home theater systems will be available this month with suggested retail prices of $899 and $799, respectively. In Canada, the prices are C$999 and C$799 respectively.